Punctuation in song titles is not a subject you see discussed that often, but this week I get to combine my love of music and my editing background. The reason: this week in 1988, a song with a controversial comma appeared on the ARIA chart. Besides brackets, which were used quite liberally in the '80s, punctuation doesn't appear that often in song titles. Over the years, there's been the odd comma ("Get Outta My Dreams, Get Into My Car"), colon ("The Key: The Secret"), and, thanks to Britney Spears, a couple of ellipses and an exclamation mark for good measure ("...Baby One More Time", "Oops!...I Did It Again"). Even the hashtag has crept into usage, thanks to Mariah Carey ("#Beautiful") and the punctuation-loving Will.i.am (#thatPOWER). Then, there's the question mark. How many titles that are actually questions are missing that all-important punctuation mark? "What Do I Have To Do", "Where Do Broken Hearts Go", "What Is Love" (Haddaway, not Howard Jones)... all of those titles are treated as statements. Another song, like Howard's "What Is Love? ", that does use correct punctuation is "What Have I Done To Deserve This? ", but then Pet Shop Boys are pedants for that sort of thing - as well as writing song titles in sentence case (so, for them, it's "What have I done to deserve this?"). Before we get to the story of that comma, at number 1 on the singles chart this week in 1988, Robert Palmer and his band of babes held on for a second week with "Simply Irresistible". 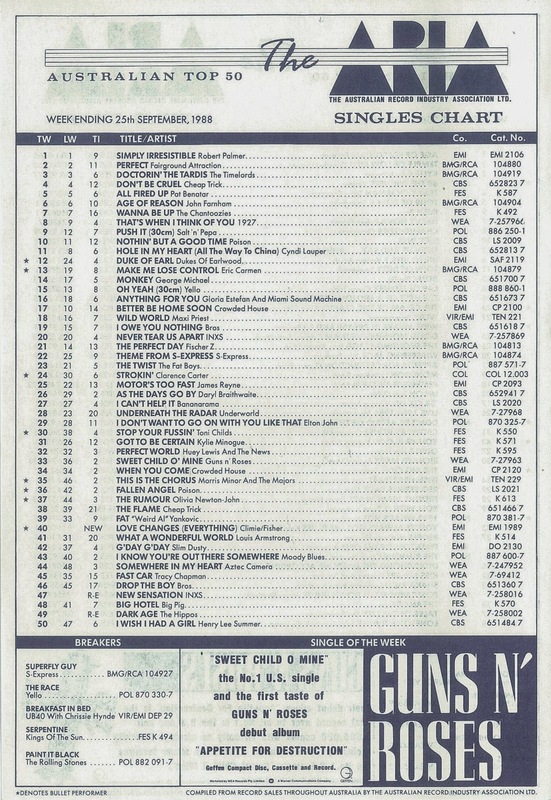 Steve Winwood was still on a, er, roll in the US, with this latest single from Roll With It reaching number 6, but like the album's title track, the song (with correct punctuation in its title) performed considerably worse in Australia. Well, when I say the story, I mean the stories, since, over the years, there have been a number of theories about the pesky comma in the title of one of The Rolling Stones' best known songs. Was it a statement about race and the civil rights movement? Was it a direction to someone called Black to paint it? According to band member Keith Richards, it was an error by the record company, Decca. The comma wasn't part of the title until the artwork for the single was produced and it seems that someone put a comma in where one wasn't meant to be. But, it stuck and has remained in the title until as recently as 2012 compilation album GRRR! So why was a 22-year-old song back in the charts in the first place? 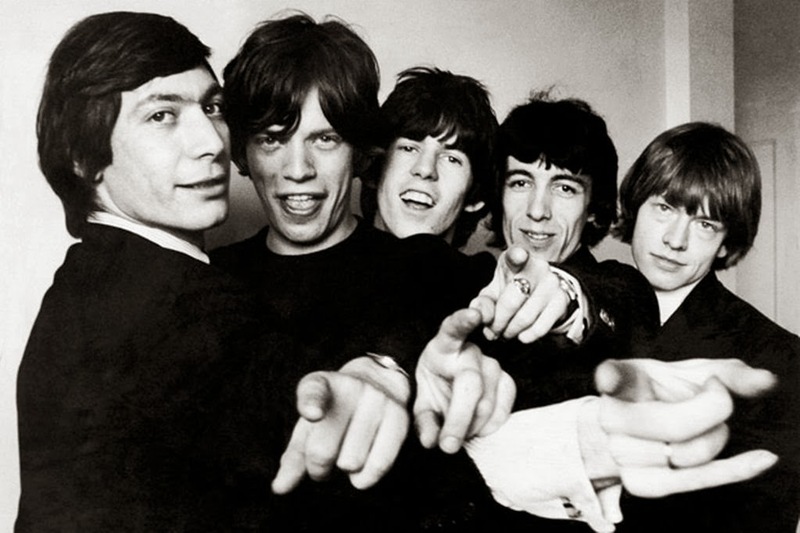 The Stones had TV series Tour Of Duty to thank for the renewed interest in "Paint It, Black" since the Vietnam War drama used the track as its theme song. The track had also been used in the closing credits for 1987 Vietnam War film Full Metal Jacket - and so the song, although not originally about the controversial conflict, became associated with it. "Paint It, Black" didn't end up revisiting the chart highs it had first time round (the Kent Music Report lists it as a three-week number 1 in Australia in mid-1966). Instead, it seems people were buying the Tour Of Duty soundtrack, which was still in the top 20 on the albums chart after 18 weeks. The three-year-old "Oh Yeah" was still riding high inside the Australian top 20, but this week a brand-new track by Swiss group Yello started gaining momentum. The first single from the Flag album, "The Race" would do what "Oh Yeah" hadn't in the UK and reach the top 10, becoming their biggest hit there. In Australia, however, it was a very different story and the track didn't qualify for the top 50. One of my favourite songs of 1988, this UK number 2 hit had originally been released in 1987 only to stall at number 67. 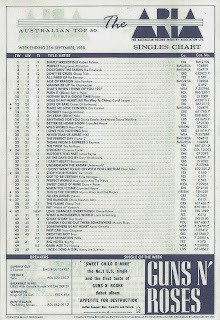 But, with the success of "Rise To The Occasion", particularly its dance remix, "Love Changes (Everything)" was re-released to a much bigger reception there. The song did pretty well here, too, but the spurt of success was short-lived and Climie Fisher's subsequent singles didn't fare anywhere near as well. The duo split after a second album, with both Simon Climie and Rob Fisher (who passed away in 1999) writing hit songs for other artists. One new entry? That's a bit lame, right? 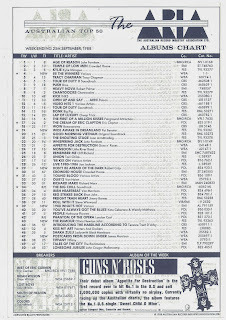 Well, I'm really left with no option but to turn the chart over and look at what was happening on the albums top 50. 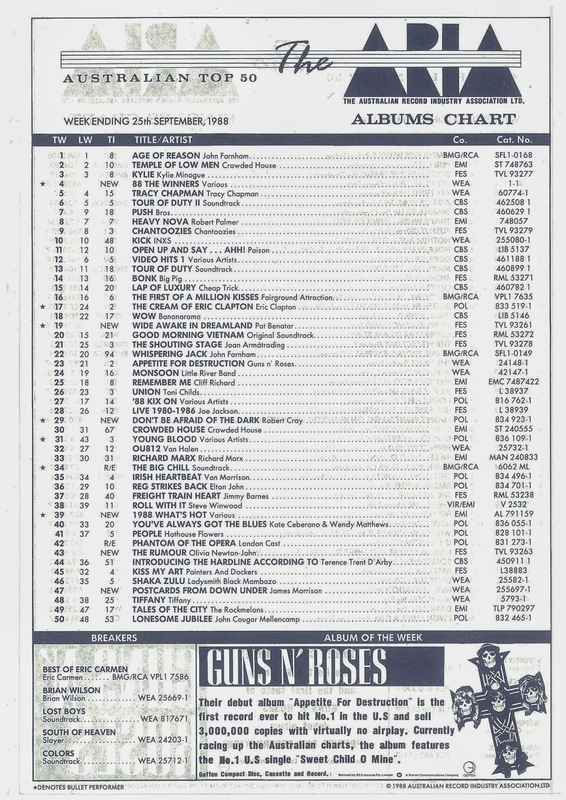 There was a much more satisfying tally of six new entries on the albums chart this week 25 years ago. I won't go through them all, but will talk in general about some of the things happening on the top 50. The week's biggest new entry came from the latest all-star various artists compilation. 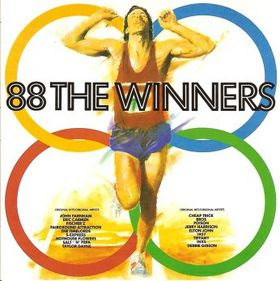 88 The Winners (which included "Doctorin' The Tardis", "New Sensation" and recent number 1 "Perfect") had an Olympics theme, since that year's Seoul Games were still running at the time. I don't normally notice catalogue numbers (I'm not that much of a trainspotter!) but that album's number of 1-1 was a nice touch. Luckily, the album was a winner, reaching number 1 and staying there for four weeks. Meanwhile, the other hits compilation of the day (they always come in pairs) didn't fare as well, despite boasting the week's number 1 single among its tracks. 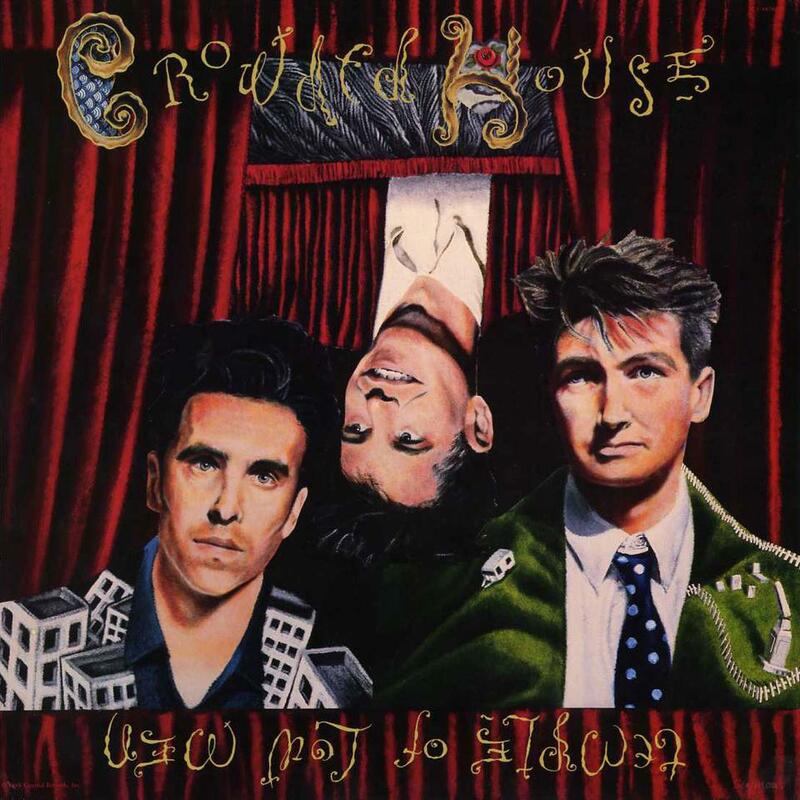 1988 What's Hot (which also featured "Got To Be Certain", "Better Be Home Soon" and "All Fired Up") debuted at a rather dismal number 39, but would end up rallying and peak at number 2 for three weeks. Above 88 The Winners were three albums by Australian artists, including John Farnham and Crowded House, who held the top 2 spots with their latest releases, Age Of Reason and Temple Of Low Men. Those acts were also responsible for the chart's longest-running albums with previous releases Whispering Jack and Crowded House benefitting from a sales resurgence. It was a pretty good week for Australian artists all round, with 15 out of the 40 artist albums in the top 50 (the other 10 were compilations or soundtracks) coming from local acts. Even some home-grown pop made an impact with the debut albums by Chantoozies and Kylie Minogue both managing a spot inside the top 10. And, just for something a bit different, a number of albums in the top 50 were by acts who hadn't been anywhere near the singles chart in recent years or, in some cases, ever. 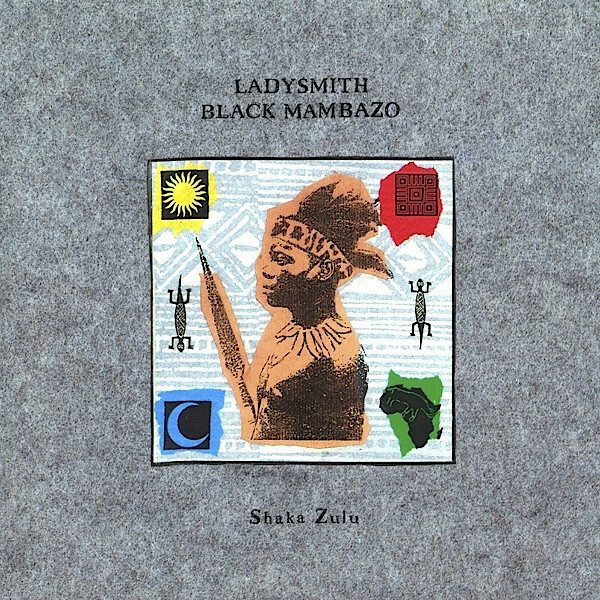 Artists like Ladysmith Black Mambazo, Robert Cray, Van Morrison, James Morrison (no relation) and Joan Armatrading all ranked among the week's biggest sellers. Next week: some more action on the singles chart thanks to one of the most exciting dance acts around and a reunion between two artists who'd previously collaborated on an Australian number 1 single. Before that, I'll make a start on my countdown of my favourite songs from 1997.